Last Thursday morning after eating breakfast, our well-known black horse Ferrogamo began to show signs of great discomfort, noted first by Quailhurst stable groom Jose. Shortly following the episodes of pain, he was transported to Willamette Valley Equine Hospital just 16 minutes from our farm. After multiple tests, it was decided that there was no alternative than to put Ferrogamo into surgery. His colon had been displaced, causing severe pain. 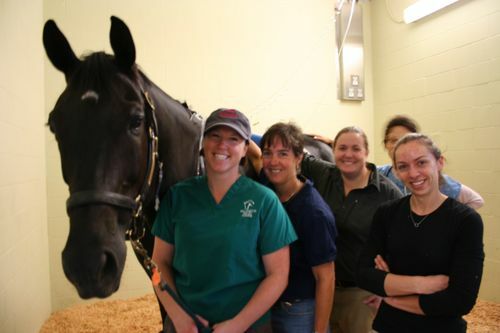 Ferrogamo with Dr. Karen Blake, Dr. Jennifer Saunders, and the rest of his dream team at Willamette Valley Equine. Friends Molly, Karen, Dar, and Lis would not accept “no” for an answer and wanted to be there to see him in recovery and to be part of my support team. Words can’t thank you enough. You created conversation and laughter to distract me from a very trying experience. He is my baby and we were both very scared. The surgical team was new to me for it has been many years since we have had a horse in need. Dr. Karen Blake (surgeon), Dr. Jennifer Saunders (our primary care doctor), and the entire staff became our “Dream Team.” How fortunate that the ability, knowledge, and competence of this medical group are right in our backyard! I will be eternally grateful for the quality care, the genuine compassion for the horse, and the desire to help him back to health. The words thank you hardly seem adequate but, sincerely, “THANK YOU.” I would refer anyone to this fabulous group of professionals. Ferrogamo is currently recovering at Willamette Valley Equine and appreciates all the love and support from his friends and fans. He is already hamming for the camera and sucking up to the staff to get more food! Above: Ferrogamo with Dr. Karen Blake, Dr. Jennifer Saunders, and the rest of his dream team at Willamette Valley Equine.